An often overlooked but simple and effective way to increase productivity and reduce stress, tool boxes and tool box cabinets are a must have in every shop. They give you the freedom to consolidate your tools which will help save space and reduce clutter, so you can keep movement easy. Also, they provide a level of organization that will ensure you always know where everything is. Reduce time spent looking for necessary tools and get back to getting the job done sooner than ever. Find any size tool boxes that will handle all of your hardware with ease. We have smaller options that are highly portable, from 19 to 22-inch chests that provide a quick and simple space for your most important tools and can be easily placed anywhere. Larger options have multiple drawers, giving you a greater degree of customization and organization to separate your tools into groups or any other method that helps you find what you need with ease. 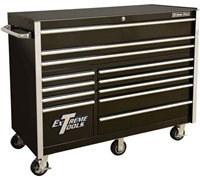 Tool box cabinets will give you the largest amount of control over your hardware. Becoming an entire piece of furniture for your shop, they have many included drawers of various sizes, perfect for holding everything from hand tools to power tools to parts and more. Most options include wheels and handles to keep them portable, so you can place them anywhere and move them with ease. Up to fifteen drawer cabinets will give you an incredible amount of space to handle any amount of hardware you need. We have the largest selection of tool boxes and tool box cabinets that will help you make the most of your shop or garage. Find the best equipment from top brands and get the quality and reliability you need to work confidently and hassle free every day. When working on automobiles, many different tools and pieces of equipment are necessary. There are many parts that can need repairs and replacements, and many different models of vehicles that might roll into your shop. Having all of the tools necessary to handle each project can start to take up a lot of space, and it can be difficult to find the right storage solution to handle the load. We have a great selection of wall tool storage options that will help you make the most of every inch of your shop, so you can get your hardware secure and out of the way. Not only will good storage options give you extra space to work with, but they will also provide an excellent level of organization to your garage. This is important because it will help ensure you can find the tools you need in no time at all, as you will always know exactly where they are. Waste less time looking for the right tool and save yourself the hassle and stress every day. The benefits of great wall tool storage solutions cannot be underestimated, and you will love how much easier they make your day. Our selection of storage options includes shelves, rails, bags, carts, workbenches, and more. Panels and shelves can be installed onto any wall surface to create an instant storage space wherever you need it. The floor of any shop is often already full of hardware and machinery that is necessary to handle a variety of jobs, so take advantage of the space above it for your smaller tools. This will help you maximize the utility of your shop and get the space you need without causing more clutter, so you are free to move without hassle and get jobs done with ease. Find the largest selection of wall tool storage solutions with our options. We provide high-quality equipment to people around the nation so they can get the tools they need to handle any job quicker and easier than ever. Make sure your shop is ready for the next project!